The kids chose Vivid as the theme for #halftermphotofun and, following on from the extraordinarily bleak weather we’ve had over the last few weeks, I for one was happy that a bit of colour would most likely appear as people interpreted the Vivid theme. There have been some lovely interpretations, mostly focussing on vivid colours but not all, check out the black and white photo of the old man’s vivid face, I’m not sure there is a better interpretation than that. A vivid imagination is required to create the great art and literature that we enjoy and this has been beautifully captured in many of the images sent in. As for the fish, the sender was flagging up the colour but I reckon there would be a pretty vivid smell as well. Objects and experiences can also bring back vivid memories of things we have done, places we have been or of people who are sadly no longer with us. One of the things that we like best viewing the photos when the come in, is not just looking at the interpretation but where and who they are from and in particular it’s great when other children take part, after all the whole idea behind this is created by my own children who set all the themes for the various photofuns that we do. Youth has been to the fore this week with photos from a 3, 5 and 8 year old as well as entries from my kids. I think it creates a playful nature to the whole affair, introduces the idea of visual interpretation to children and keeps all the clever adult photographers on their toes. You can’t immediately tell which photos are from adults and which are from children and indeed one of my favourites in this weeks collection is from an 11 year old. We really appreciate everyone who takes part, its good fun but is also teaching valuable lessons in the power of social media, how ideas and pictures can spread for example. 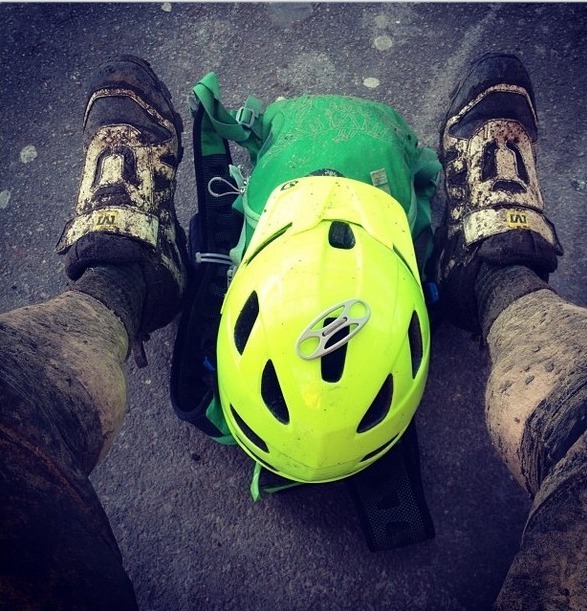 The photo at the top is of Tom Hill and I loved it straight away, the contrast between the vivid green of Tom’s helmet compared to his mud caked legs, a vivid reminder of the weather we’ve been having. As those who read this blog regularly or follow me on twitter (@ianstreet67) will know I like riding bikes and Tom’s photo immediately brings back vivid memories of similar rides and I’m sure that the ride Tom had just completed will be lodged away in his memory bank. I hope I haven’t missed out any photos, but I usually do so I apologise in advance if this is the case. Let me know if I have missed you out and I’ll update the gallery. If you click on the gallery it will open up and you can scroll through the photos in all the vivid originality they were sent in. Keep your eye on my twitter feed for the odd #weekendphotofun and the next week-long ones will probably be April – #Easterphotofun. Thanks to you all for making this week a colourful one.